Remembering “when life gives you lemons” and having an overabundance of not lemons but winter squash (compliments of my beloved CSA), I decided to find them a starring role. Sure, we’ve enjoyed them roasted and in muffins but it wasn’t until this soup that the humble butternut squash claimed top billing at our dinner table. This is no thin and watery soup. It’s intensely orange (or is it saffron or, better yet, butternut? 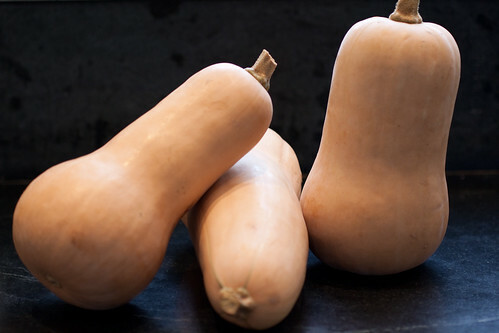 ), rich, velvety, and satisfyingly squashy – perfect for a chilly evening. Perfect, that is, when garnished with plenty of cinnamon sugar croutons, a dollop or two of cinnamon whipped cream, and a sprinkle of tangy ruby red pomegranates. (And yes, I admit that I’m pomegranate obsessed!) Served this way, even my 4-year-old, a former vocal leader of the “ewww! – squash soup” camp, laps it up and asks for more. *If you’re not rolling in butternut squash like we are, you can substitute delicata or carnival squash. Heat butter in large Dutch oven over medium-low heat until foaming; add shallot and cook, stirring frequently, until softened and translucent, about 3 minutes. Add squash seeds and strings and cook, stirring occasionally, until fragrant and butter turns a saffron color, about 4 minutes. Add water and 2-3 teaspoons kosher salt to pot and bring to boil over high heat. Reduce heat to medium-low, place squash cut-side down in steamer basket or pasta insert, and lower basket/insert into pot. Cover and steam until squash is completely tender, about 30 minutes. Off heat, use tongs to transfer squash to rimmed baking sheet to cool down. When squash is cool enough to handle, use large spoon to scrape flesh from skin into medium bowl; discard skin. Reserve steaming liquid (consisting of sauteed butter, shallot, seeds, strings, water, and salt). Strain reserved steaming liquid through mesh strainer into another bowl; discard solids (meaning spent shallot, seeds, and strings) that remain in strainer. (You don’t need these solids anymore since you’ve already gotten all the squashy flavor, color, and aroma from them.) You’ll need a total of about 2½-3 cups steaming liquid as any more makes the soup too thin. Using a hand blender or a regular blender, puree squash and some of the reserved steaming liquid in batches, pulsing on low until smooth. Add just enough liquid to make a thick puree. Transfer puree back to Dutch oven and add rest of steaming liquid (up to 3 cups total), cream, and brown sugar. Warm over medium-low heat until hot. Add nutmeg and salt to taste. Ladle into bowls and top with cinnamon sugar croutons, dollop of cinnamon whipped cream, and pomegranate. The soup can be refrigerated for several days. Warm over low heat but do not boil. Adjust oven rack to middle position and heat oven to 350°F. Cut bread into ½-inch cubes. Toss cubes with melted butter. Combine sugar with cinnamon, and toss bread cubes with mixture. Spread cubes in even layer on parchment-lined baking sheet; bake until crisp, 10-15 minutes. Chill bowl and beater. Whip cream until soft peaks form. Then whip in cinnamon and sugar. 15 Responses to "Butternut Squash Soup"
On another note, have you found the chocolate covered pomegranate? I hear they are divine! Hello from Paris, France! Its not clear to me from the recipe if we blend the seeds and strings into the soup? Thanks for clarifying. Kristin. Thanks for checking things out from Paris. Very cool. As the humble husband, I have been known to be wrong, but I am nearly 100% certain that I did not eat the seeds or strings. I believe they come out, but I’m not sure where. Sooooo, I’ll wait for Jenn to make any edits to the recipe. But, if you’re already making it, take out the seeds and strings sometime! Bonjour, Kristin! (Sadly, that’s the extent of my French.) Sorry that I was unclear in the instructions and will edit them to clarify. After steaming the squash until tender, you’ll strain the steaming liquid (consisting of the sauteed butter, shallot, seeds, strings, water, and salt) into another bowl. Then discard the solids (meaning the spent shallot, seeds, and strings) that remain in the strainer. 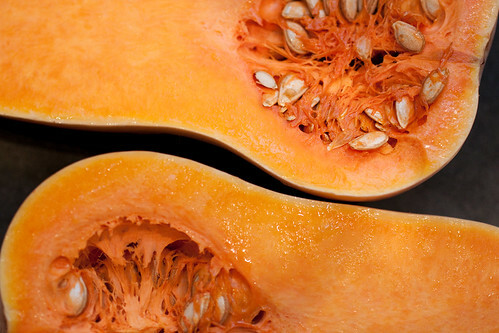 You don’t need the solids anymore since you’ve already gotten all the squashy flavor, color, and aroma from them. Reserve 2 1/2 – 3 cups of this strained steaming liquid in your bowl. You’ll use some of it when pureeing the cooked squash and then add the remainder (up to a total 3 cups) along with the cream, brown sugar, and nutmeg to round out the soup. And don’t forget the toppings – they really make the soup! Please let me know if you have any other questions. Cinnamon? And butternut squash? MY FAVORITE INGREDIENTS COMBINED!? Haha. This soup looks awesome, Jenn. Hopefully Ill get to try it this week. This is my go-to recipe for butternut squash soup as well. Those Cook’s Illustrated folks know what they’re doing. I’ve yet to convince my family of its deliciousness, though. I’ll try the cinnamon sugar croutons and see if that entices them to give it a try. Sure, Karen, you can come over and have a bite the next time we have this. And the next and the next as we still have quite a pile of winter squash to get through. I’ve never heard of chocolate covered pomegranate but what a fun fruit to add to our fondue dipping favorites. Hi Kristin. Glad to hear that your family, like mine, gives you guidance in the kitchen and that you had luck with the soup. We’re in Nashville, TN, so we were spared by the big snowstorm. However, my cousins in Washington, DC got 22″ of snow! CI rocks and is always the first place I turn! The cinnamon sugar croutons are good on their own but really the croutons, cinnamon whipped cream, and pomegranate make a fine topping trinity. Or if your family prefers a variety of choices, you could do a toppings bar – offer the trinity along with some toasted spiced pumpkin seeds, thin slivers of apple, balsamic vinegar, fried shallot rings, etc. and let each person choose their favorites. Let me know if it works. hi jenn and tim, this is kristin’s mother from the maryland burbs of dc. 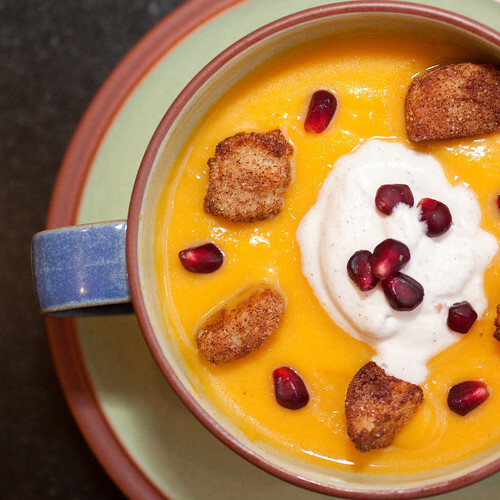 we enjoyed your recipe for butternut squash soup but we have an even better one without the heavy cream and brown sugar. if you are interested i’ll respond to your return e-mail later this week. all the best , sharon duncombe – p.s., please share with krisitn. Thanks for the comment… Help us place you… to which Kirstin do you refer? i am sharon duncombe, mother of kristin duncombe in paris. my recipe is from the gourmet cokbook. without typing the whole thing, the key is ginger and lime. saute chopped onion and ginger in butter; then add peeled squash, garlic cloves, water and chicken broth and cook until the squash is softened. then puree. when ready to serve reheat and stir in lime juice and top with a slice of lime and fried julienne of ginger. feel free to adjust the garlic, lime and ginger to your own taste. this is always a winner without the cream and brown sugar. This is so funny! Can’t believe my mother and I have crossed paths on your recipe page!! Small world! And we had butternut squash soup again tonight!! Greetings to all! I enjoyed this article so much! I am writing a stuffed squash recipe myself today and was looking for Nashville resources to purchase the squash itself when I ran across your site. Love it! Kudos to you and Cheers!